Kathmandu, Feb 7 (The Kathmandu Post) – In what could be the biggest incident of trafficking of Nepali citizens in a month, authorities in Manipur, the northeastern state of India, and activists have said that as many as 301 Nepali men and women might have been smuggled into other countries using the India-Myanmar border. The rescue operation of Nepali citizens being trafficked to Southeast Asian and Gulf countries, which started on Friday morning, has gathered more pieces of evidence that show they were trafficked into Myanmar via Moreh–on the India-Myanmar border–between December and January. One Nepali girl, who is believed to be from the same group of 301 that crossed the border and entered Myanmar, was rescued by the Yangon Anti Trafficking Task Force, along with the immigration centre at Pazundaung Township, on Tuesday, according to Emarine Kharbhih, programme manager with the Impulse NGO Network, a non-governmental organisation working in reducing human trafficking in the region and also involved in the ongoing rescue operation. Her rescue was possible when she made a call to her family in Nepal and asked for help after crossing Moreh. The information was again relayed to Impulse by Maiti Nepal. “Using the Impulse Model Case Info Centre Software alert, we informed our partner in Myanmar which then informed the local authority before she was rescued by the task force,” Hasina Kharbhih, founder and chairman of Impulse NGO Network, told the Post. However, one of the girls has been already trafficked into Kuwait, according to Kharbhih. “As many as 301 have crossed the border from December to January via Moreh border. Those crossing the border have not returned,” Keisam Pradip Kumar, a member of Manipur Commission for Protection of Child Rights, told a press conference held at the Imphal Press Club to brief about the latest operation. Those involved in the rescue operation, however, said there have been no details yet regarding whereabouts of those girls who have already entered Myanmar–or those who have gone further to other countries from there. Emarine Kharbhih said the local authorities and activist could not confirm whether they were still in Myanmar or moved elsewhere. “We have to work with the Myanmar authority and other partners to track them. Now the next round of operation will take place in Myanmar to track those who have already crossed the border,” Emarine said during the conference. The recent rescue mission that started last Friday morning, after a tip-off by Maiti Nepal, and jointly led by Manipur police, Social Welfare Department and NGOs working in the field, has so far rescued 183 Nepali citizens, including 17 men from various parts of the Manipur state. The rescued are housed at the Social Welfare Department of Manipur. “The first round of verification has shown that all of them are from Nepal. They have admitted–and the documents they have also prove they are Nepali citizens,” said Kumar. The rescue team has said that further verification would be done in Nepal before their repatriation which will take some time. “In other rounds of verification, our partners in Nepal will find out their families and check their citizenships back in Nepal. Then the Nepali Embassy in India will be contacted to further verify that they are Nepali citizens before repatriating them,” Emarine added. According to Emarine, the Ministry of Women, Children and Social Welfare in Nepal has been informed about the recent rescue mission. When the Post contacted Spokesperson for the ministry Rajendra Kumar Paudel, he said they had informal information about the rescue of Nepali citizens from Manipur. “The Ministry of Foreign Affairs takes initiatives in such cases and asks the embassy in the respective country to act. We mobilise the team as per directives from the Foreign Ministry,” Paudel said. 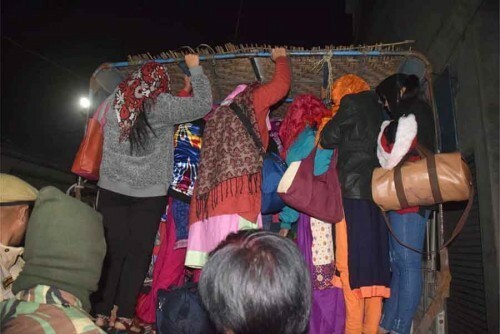 Bharat Kumar Regmi, deputy chief of mission at the Nepali Embassy in New Delhi, told the Post that a team from the embassy had already reached Manipur and that it would begin the verification process of the rescued Nepalis.